The Ibadan Malimbe Malimbus ibadanensis is a rare and local black-and-red malimbe. 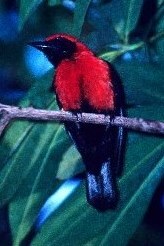 It is similar to the sympatric Red-vented Malimbe, both having a red head and breast and black face, but the Ibadan Malimbe has a black vent. The male Ibadan Malimbe is nearly identical to the male Cassin's Malimbe but their ranges do not overlap. The female Ibadan Malimbe is red on top of the head and has a narrow red collar and breast-band while the female Cassin's Malimbe has a black head, and the female Red-vented Malimbe has a black head and neck. The juvenile is sooty, with a dull orange breast-band, dark red-brown face patch, and tawny chin and throat. 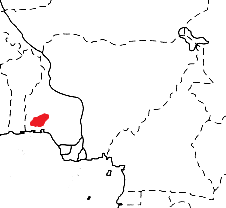 The Ibadan Malimbe is found in SW Nigeria (see map below, based on Birds of Africa). The Ibadan Malimbe inhabits forest patches, forest edges, secondary forest and woodland, often along tracks and openings in the forest. It also visits gardens and cultivated areas. Recent observations of foraging birds suggest a possible link with the kola tree Cola gigantea. The diet of the Ibadan Malimbe includes insects, caterpillars, winged ants, alate termites and palm nuts. It forages primarily in the middle storey, searching leaves, flowers, and dry pods and leaf clusters. The Ibadan Malimbe does not cling to tree trunks like the nuthatch-weavers. It occurs in pairs or in small groups, and often joins mixed-species flocks with other forest weavers or birds. The Ibadan Malimbe is monogamous and a solitary nester. The nest resembles an inverted sock, and has an entrance tunnel 20-25 cm long. The nest is woven from strips of palm leaves and tendrils of climbing plants. One male worked on two separate nests and the female lined one of them. In one case a second male assisted the primary male in nest construction. The nest is placed 12-20 m above the ground near the tip of a branch of a mature forest tree. Nests may be close to active wasp nests, or in the same tree as Red-headed Malimbe and Fork-tailed Drongo nests. The Ibadan Malimbe may be suffering from nesting competition by other malimbes, weavers or drongos that also nest in mature forest trees. The eggs (clutch 1-2 eggs) are pale greenish-white with small dark brown spots and underlying lilac shading. Incubation is by the female, and chicks are fed by both parents. There are no PHOWN records for the Ibadan Malimbe (see PHOWN summary), and many are needed. Submit any weaver nest records to PHOWN (PHOtos of Weaver Nests) via the Virtual Museum upload site.